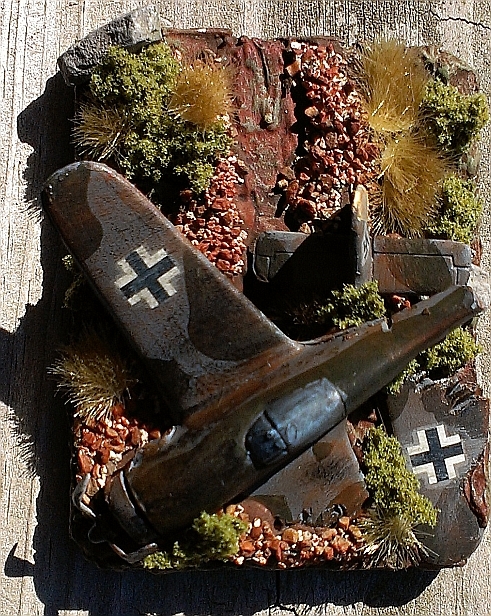 Dice Devils GC: Focke......Focke-wulf that is! So with the box in hand, I noticed once unpacked and assembled is, this kit is extremely basic. The decal sheet was horrible and the parts lacked even the simplest of detail, like lines for panels, wing detail.....but then for $6 I guess I should be happy all the parts were in the box. Assembling the model took no time at all and gave me a chance to size it up on a base. It was going to be too large for the base and not going to fit and look 'right', but I had other plans. I already knew I would be painting it and then breaking it into pieces in order to make my objective look good. 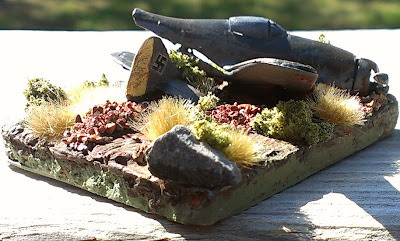 The base I used was simply a piece of cardboard covered in a panel of cork. 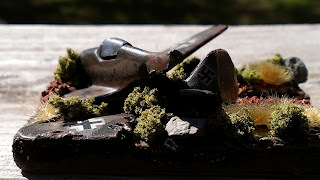 I used wall repair paste to base the model onto the cork and also gave me a good way to give it that 'ditched' effect. I was able to make the model fit on the base by cutting one of the wings off and I figured I would break it's back. I did all this and the 'scars' using a small pair of wire cutters. I did not have my phone with me, so I only have pictures of it based and then adding some more details around the aircraft and finally painting the base again in a few more dry brushed on coats of lighter brown and green. Model painted, based and some basic touch ups. After I had a look at the rest of the decals, I knew I could not get the good ones for the fuselage to fit right. Even after cutting them to size, they did not want to come off the decal sheet. Maybe the glue had dried up after all this time and soaking them longer did not even free them up. 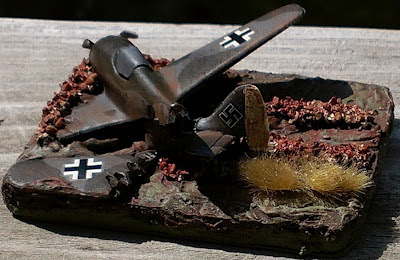 I had the wings and the tail done, so I will keep my eyes open for a few iron crosses so I can touch up the side fuselage later. I'm pretty sure it turned out ok for my first go at something 'original' for Flames and I am looking forward to tabling it in the very near future. I've added some pics of my finished project. I took it outside in the sun to better show some of the colors and detail. Another side shot, can't wait to add side markings. I'm reminded of (I think) Clive James who used to make model planes in his youth in Australia (during WW2). Back in those days you didn't have kits as such - you had to carve your plane out of balsa wood. He wasn't very good at it so used to cover them in dope (the varnish, not the drug) - set fire to them and chuck them out the window to simualate AA fire. Now that's a childhood I wish I'd had!